Governor Kim Reynolds delivers her victory speech. There were historic victories in Iowa for three women on the 2018 ballot. 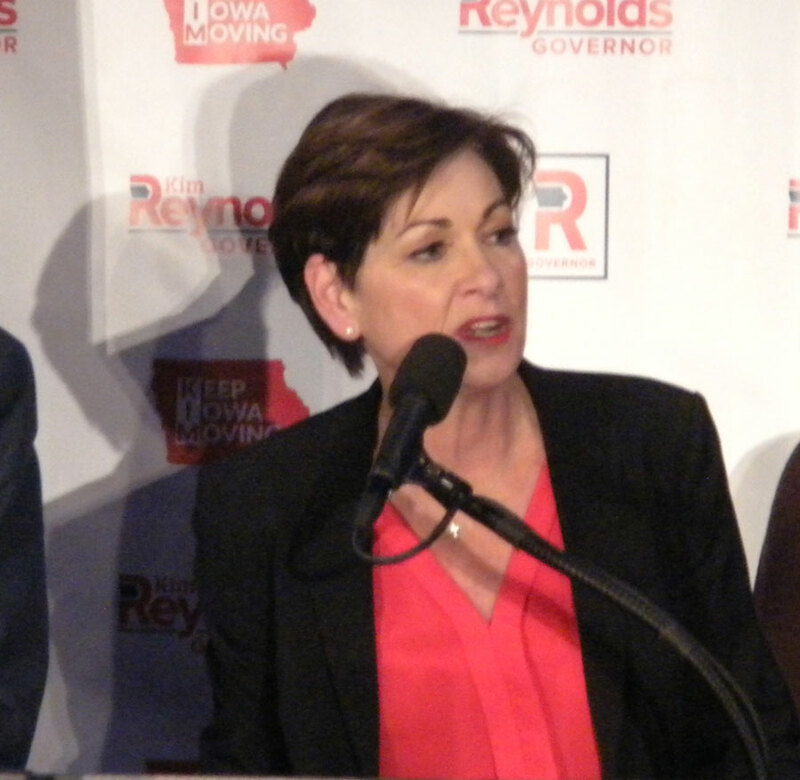 Today is the 532nd day Republican Governor Kim Reynolds has been Iowa’s governor and Iowa voters on Tuesday gave her a full, four-year term in the job. “Thank you, Iowa! 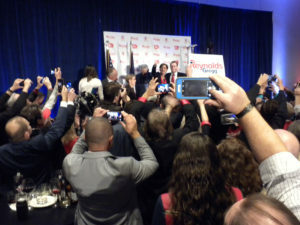 What an honor,” she said to cheering supporters at Iowa GOP headquarters as the clock struck midnight. 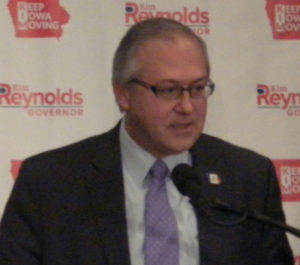 Reynolds was elevated from lieutenant governor to governor in May of last year when Terry Branstad resigned to become U.S. Ambassador to China. Governor Reynolds and Lt. Governor Adam Gregg. Democrats Abby Finkenauer of Dubuque and Cindy Axne of West Des Moines are the first women from Iowa to be elected to the U.S. House of Representatives. “Tonight, we as Iowans made very clear exactly who we are,” Finkenauer said. Finkenauer, a 29-year-old who has served four years in the state legislature, is the second-youngest woman ever elected to the U.S. House. “This road has not been easy and we’ve been through a lot to get here,” Finkenauer said. Finkenauer won about 51 percent of the vote in northeast Iowa’s first congressional district. Republican Congressman Rod Blum of Dubuque, who was seeking a third term, finished about five points behind. The other congresswoman from Iowa will represent southwest Iowa’s third district. “We did it,” Axne said to cheering supporters in Des Moines. Axne, a small business owner, said she launched her campaign 18 months ago because she was frustrated with Washington. Axne defeated Republican Congressman David Young of Van Meter by a narrow margin of about one percent. He was seeking a third term as Iowa’s third district representative. Iowa’s congressional delegation has been made up of three Republicans and one Democrat since 2014. Only one of those Republicans — Steve King, the dean of Iowa’s congressional delegation — was reelected, by just a margin of about three percent. King told supporters in Sioux City he “hung on” despite a well-funded opponent and opposition from within the GOP. King said he’ll adjust to being in the minority in congress next year. J.D. Scholten is the Democrat who gave King the toughest General Election battle he’s ever faced. Democrat Dave Loebsack of Iowa City, the other Iowan serving in congress, was reelected to a seventh term. He defeated Republican Christopher Peters of Coralville by 12 percent. “Being in the majority means that I’m going to be able to get more done for my district, that’s the bottom line,” Loebsack said. At the statehouse, Republicans kept majority control of the Iowa House and the Iowa Senate. “It gets even better. Not only do we still have it, we expanded our majority in the Iowa Senate tonight,” Jack Whitver, the Republican leader in the Iowa Senate, said during remarks at Iowa GOP headquarters on Tuesday evening. Reynolds finished about three percent ahead of Democrat Fred Hubbell according to unofficial results. 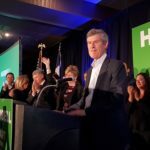 Hubbell invested $6.5 million of his own money in his race against Reynolds. 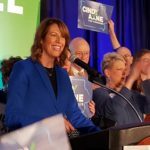 “While tonight didn’t turn out the way we would have liked, the energy and support that we have received along the way is proof a lot of Iowans know we need change,” Hubbell said. 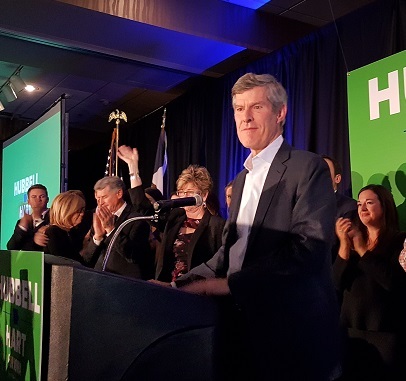 Hubbell made restoration of state funding for Planned Parenthood and undoing privatized Medicaid two of the cornerstone issues of his campaign.